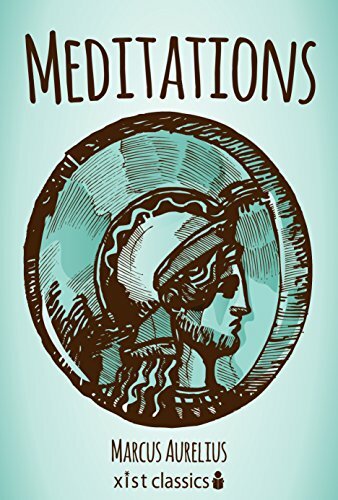 Meditations – Meditations (Medieval Greek: Τὰ εἰς ἑαυτόν Ta eis heauton, literally “things to one’s self”) is a series of personal writings by Marcus Aurelius, Roman Emperor from 161 to 180 AD, recording his private notes to himself and ideas on Stoic philosophy. One measure, perhaps, of a book’s worth, is its intergenerational pliancy: do new readers acquire it and interpret it afresh down through the ages? The Meditations of Marcus Aurelius, translated and introduced by Gregory Hays, by that standard, is very worthwhile, indeed. Hays suggests that its most recent incarnation–as a self-help book–is not only valid, but may be close to the author’s intent. Marcus Aurelius (/ɔːˈriːliəs/; Latin: Marcus Aurelius Antoninus Augustus; 26 April 121 – 17 March 180 AD) was Roman emperor from 161 to 180, ruling jointly with Lucius Verus until Verus’ death in 169 and jointly with his son, Commodus, from 177. He was the last of the so-called Five Good Emperors. He was a practitioner of Stoicism, and his untitled writing, commonly known as Meditations, is a significant source of our modern understanding of ancient Stoic philosophy. It is considered by many commentators to be one of the greatest works of philosophy. During his reign, the Roman Empire defeated a revitalized Parthian Empire in the East: Aurelius’ general Avidius Cassius sacked the capital Ctesiphon in 164. In central Europe, Aurelius fought the Marcomanni, Quadi, and Sarmatians with success during the Marcomannic Wars, although the threat of the Germanic peoples began to represent a troubling reality for the Empire. A revolt in the East led by Avidius Cassius failed to gain momentum and was suppressed immediately. Persecution of Christians increased during his reign. His death in 180 is considered the end of the Pax Romana and the increasing instability in the west that followed has traditionally been seen as the beginning of the eventual Fall of the Western Roman Empire.